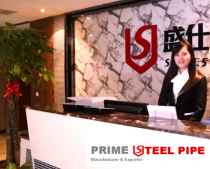 HUNAN PRIME STEEL PIPE is the export gateway of SHINESTAR HOLDINGS GROUP. We are dedicated in providing and exporting high performance-price ratio welded & seamless steel pipes and fittings covering various steel grades. At Prime Steel Pipe, we believe that honest communication, expertise in our industry, and prompt execution lead to strong long-term relationships. Our professioanl team provides " one-stop procurement" servics to coordinate with your project regulation, site and terrain, and ensure the best quality of products by assigning skillful experts at every stage of production. Our principles is to keep the honesty in mind, to win reputation by trust. We strives to providing quality products, competitive price and value-added services to our clients throughout the world. What is Galvanized steel pipe? Heat the iron and steel industry will continue in 2017?